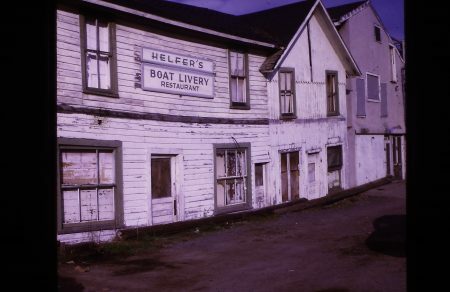 Helfer’s Boat Livery and Restaurant taken in the 1930s. Photo courtesy Greg Switzer. This would have been located next door just east of where Krenzer’s Marine is today on Greig Street. Later the building would be Leo Helfer’s Bar. Gail Wackerle remembers: As you drove through down town, the building with the window s & curtains was Leo Helfer’s bar. The place that looks gray was, I believe, Baycorns. It also had a concrete hangover, that you could walk under, if you got caught in the rain. 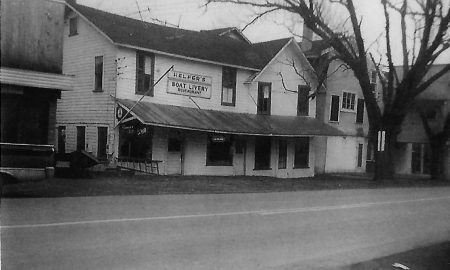 Next was Jacks which was called Pinky Lees, then the Dolphin, and was owned by Ken Collier, also built for him , as I was a kid.